Samsung introduced the world to SUHD TVs at CES 2015, and now it's introduced us to the sets' price tags. We still don't know what the "S" in "SUHD" stands for - Super-Ultra HD? Samsung Ultra HD? - but we do know that these screens feature superb pictures with high contrast, nice color and great brightness. And now we also know that they'll cost between $3,500 (about £2,360, AU$4,600) and $10K (about £6,740, AU$13,180) and include both curved and flat versions. But between those two extremes are a number of different models to choose from, and Samsung detailed them all today. Launching first is the Samsung JS9000, a curved line that's available now. These models come in at 48 inches ($3,500), 55 inches ($4,000, about £2,700, AU$5,275) and 65 inches ($5,000, about £3,370, AU$6,600). Next up is the Samsung JS9500, a line that includes three curved TVs at 65, 78 and 88 inches and starting at $6,500 (about £4,380, AU$8,570). They'll launch this month. The JS9500 sets also include Samsung's "One Connect Box," a modular "brain" that can be swapped out for future models. 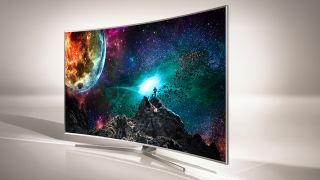 Then there's the JS9100, another curved set at 78 inches and $10K. It will be available starting in May. Finally, the Samsung JS8500 is the lone SUHD set that isn't curved, but flat. It comes in 55- and 65-inch versions at $3,000 (about £2,000, AU$4,000) and $4,000, respectively. These, too, are available now. Samsung also detailed multiple new standard UHD (no "S") lines today, including the JU6700 and JU7500 curved sets, plus the JU7100 flat models, all of which will be available before summer. We have plenty of TV reviews!